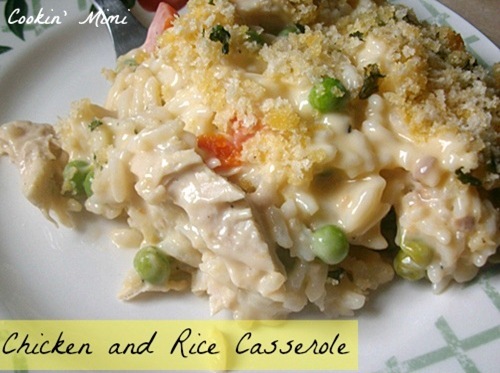 Chicken and Rice Casserole is easy to make and freezer friendly. Make a double batch to have for busy nights. I’ve noticed when it comes to casseroles most people either love them or hate them. I, obviously, fall in the love ’em category so I’m always on the look out for new ones. Another type of recipe I’m on the look out for is new ways to cook chicken because we eat a lot of it. I first made chicken and rice casserole about ten or twelve years ago and I started with Paula Deen’s recipe which is a good recipe but unfortunately isn’t freezer friendly so when I saw a recipe on Mommy’s Kitchen for a copycat of Stouffer’s Grandma’s Chicken and Rice Bake that was freezer friendly I was thrilled. Of course being me I made a few changes to the recipe. It’s very rare that I leave a recipe as written. Heat the olive oil in a large skillet over medium heat. Cook the carrots, onions, and garlic for about 10 minutes or until the carrots are tender and the onions are translucent. In a large bowl mix together the cooked rice, the cooking sauce, soups, carrots, onions, garlic, peas, chicken, and milk. Divide between two 2 quart baking dishes. In a small bowl combine the breadcrumbs, and dried parsley. Drizzle the melted butter over the crumbs and stir to coat. Sprinkle half the breadcrumbs over each casserole. Cook the fresh casserole at 350 for 40-45 minutes or until hot and bubbly and the topping has browned. Wrap unbaked casserole well in foil. Label. Thaw in refrigerator overnight.If using a glass or ceramic dish that is cold let the dish sit at room temperature for about 30 minutes to take the chill off before baking to prevent shattering. Bake at 350 for 45 minutes to an hour or until hot and bubbly and topping has browned. I am firmly in the “love them” camp also! This reminds me of a dish my Nanny used to make. Thanks so much for sharing at our Weekend Potluck. Have a great week! I’m having a baby Feb 13th so i’m writting down some recipes to make before hand and freeze. my only question is about the ‘converted rice’, Can I just use regular white rice or brown ? And does the 2C refer to 2C cooked or raw ? Thanks very much! Converted rice is another name for parboiled rice. You could use regular long grain but I’m not sure how brown would turn out and it is two cups raw rice.